Spaghetti is a long, thin, cylindrical pasta of Italian origin.Spaghetti is the plural form of the Italian word spaghetto, which is a diminutive of spago, meaning "thin string" or "twine".Pasta comes in many different colors. Most pasta is cream-colored, but some is made using spinach making it green, red pasta that is made using tomato, gray pasta that is made using squid ink, and some pasta is called "cellophane" because it becomes transparent when cooked. Procuring: Most pasta is made using wheat products mixed with water. Other types of pasta are made using ingredients such as rice, barley, corn, and beans. Egg noodles contain egg; almost all other dry pasta shapes do not. By federal law, a noodle must contain 5.5 percent egg solids to be called a noodle. So without egg, a noodle really isn't a noodle. 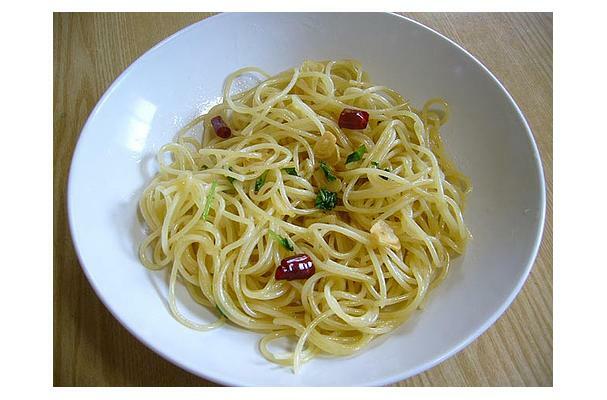 A variety of pasta dishes are based on it, from spaghetti with cheese and pepper or garlic and oil to a spaghetti with tomato, meat, and other sauces.Spaghetti is cooked in a large pot of salted, boiling water (about 5 liters for 2 persons) which is brought to boiling. Then one or two spoons of salt are added and after a minute or so the pasta is added. After 10 to 15 minutes (the timing is most often written on the packaging of sundry brands and thicknesses) the spaghetti is drained of water with a colander (scolapasta in Italian). It can be stored on the shelf in an airtight container in a dry area that is not exposed to extreme temperatures. Dried pasta can be stored indefinitely and still be safe to eat but the USDA recommends storing dried pasta for no more than two years to obtain the best quality. History: We've probably all heard that Marco Polo brought spaghetti to Europe from the Far East in the late 13th century. While it's true that he probably encountered it there -- or at least a type of long noodle made from either rice flour or hard wheat flour -- pasta had existed in Europe for centuries. In fact, a fourth century B.C. Etruscan tomb has a bas-relief carving of a group of natives making what appears to be pasta. Pasta in Italy is a long tradition!